Q: We own a large apartment complex and have just been notified by our tenants association that the tenants believe something on or in the property is making them sick. In particular, they claim that several children have been diagnosed with respiratory ailments that are similar and rare, and they think that chemicals used by our pest control company are to blame. They want us to cover the families’ medical expenses and to have the premises tested and remediated. Are we responsible for the illnesses? –Tom C.
A: If ever there were a time to say it, it’s now: Get thee to a lawyer! You’re looking at the beginnings of a “toxic tort” case, which can be hugely expensive and complicated. You don’t want to say or do anything without the advice and assistance of a competent personal injury lawyer who specializes in this type of litigation. I can, however, give you a little information that might help you prepare for what’s ahead. Cases like these are very difficult to prove and win. That’s because the plaintiffs (the injured tenants) have a very hard time proving that the defendant (you) caused the problem. Actually, they have to prove two things: First, that a particular substance (like a chemical or pollutant) is capable of causing the plaintiffs’ injuries; and second, that the plaintiffs’ medical problems were actually caused by these substances. As you can see, unless the injured parties can clear the first hurdle (typically based on scientific evidence and testimony), they will never get to the second, and they will lose their case. Your tenants will doubtless hire an attorney, and then you’re off to the races. The other side will attempt to show that the pest control chemicals cause the type of illnesses your tenants have (the first test), and that the tenants got sick because of these chemicals and not from some other cause. Unless they can prove that the chemicals are very clearly tied to the illnesses (they need to be “a” cause, not necessarily the sole cause), and the illnesses are almost never contracted except by exposure to these chemicals, they will not prevail. 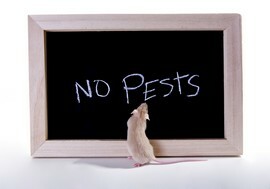 See Janet Portman’s feature, Can Landlord Charge Pet Rent?